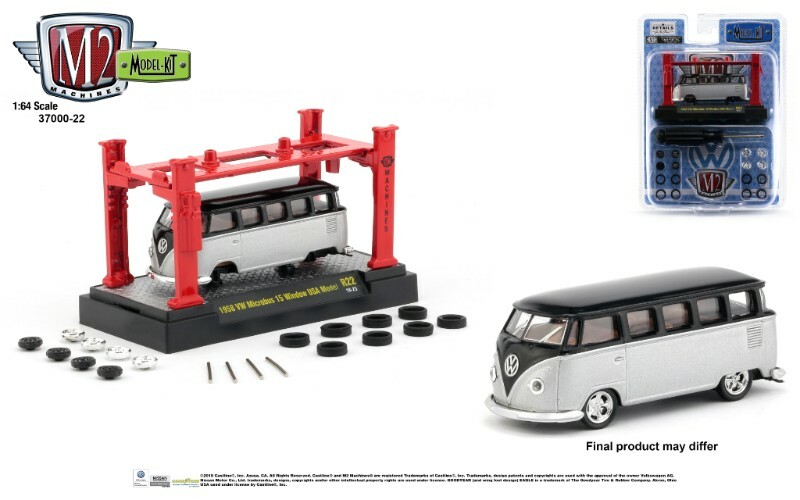 Expected from Jada toys in the spring, the 1962 T1 20th anniversary car. Scale 1/24. The Type 2 modelled was originally registered in Arizona, USA, and owned for many years by mechanic and Bonneville record holder Steve Hobbs. 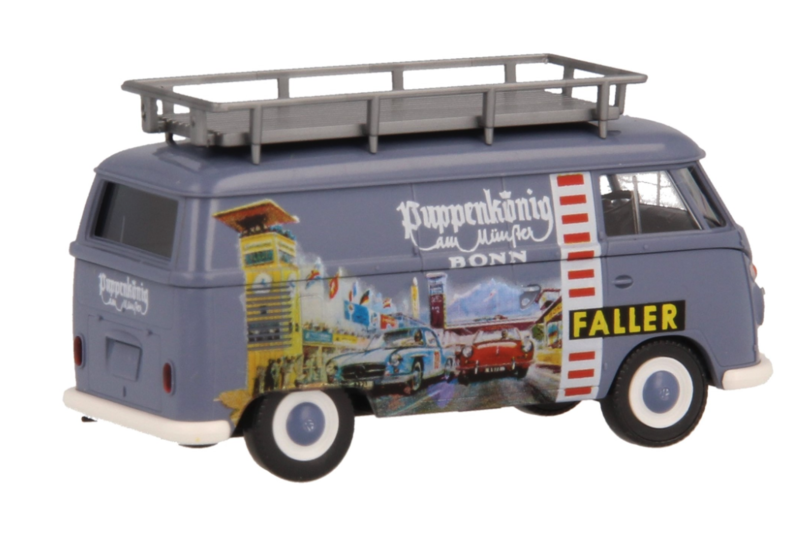 After a prolonged period in dry storage it was recommissioned by VW Type 2 specialist Douglas Denlinger, of Transporter Restorations, Arizona, who found it to be amazingly original, very solid and totally undamaged; although it was later resprayed in the USA. 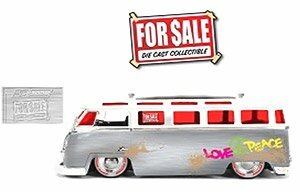 It was imported into the UK in 2005 by enthusiast Will McLaughlin who nicknamed it ‘Sandy’ because it was still full of Arizona sand, and fitted the camper interior. Current owner, West Midlands-based Steve Smith, bought it in 2011 and is an active member of the Split Screen Van Club. 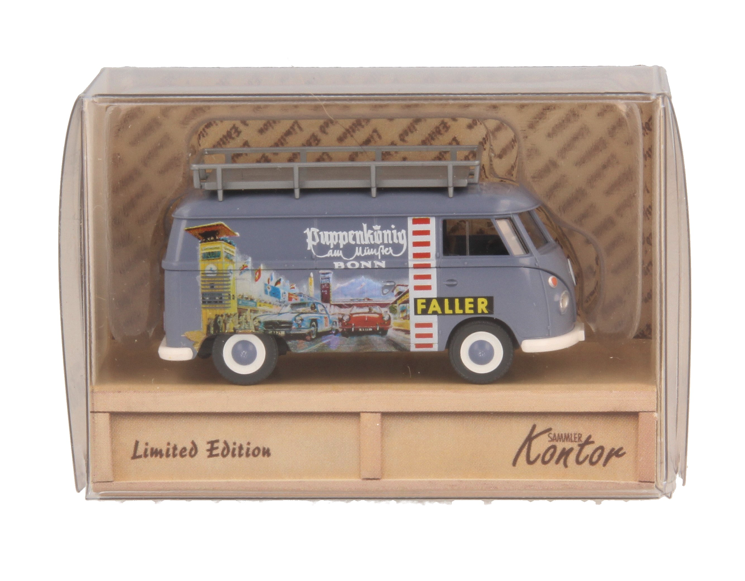 The history of the VW Type 2 starts with Dutch dealer Ben Pons, the first agent outside of Germany to sell VWs, who in 1947 drew sketch of a Lieferwagen (light delivery van) that he saw a market for in Holland. 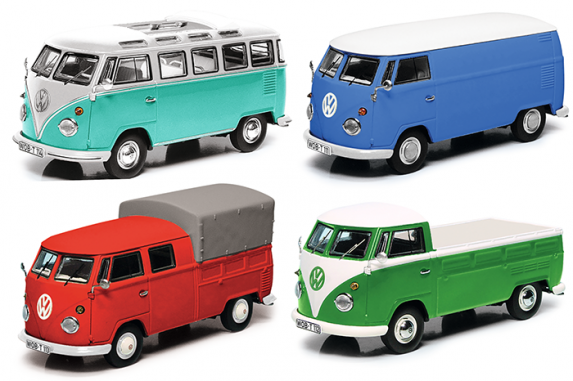 VW’s engineers worked on the concept and displayed the first vans in 1949. Great attention was given to the aerodynamics because of the engine’s low power and, using the wind tunnel at the technical University in Braunschweig, engineers lowered the original prototype’s drag coefficient of 0.75 to 0.48 by introducing the V-shaped front. 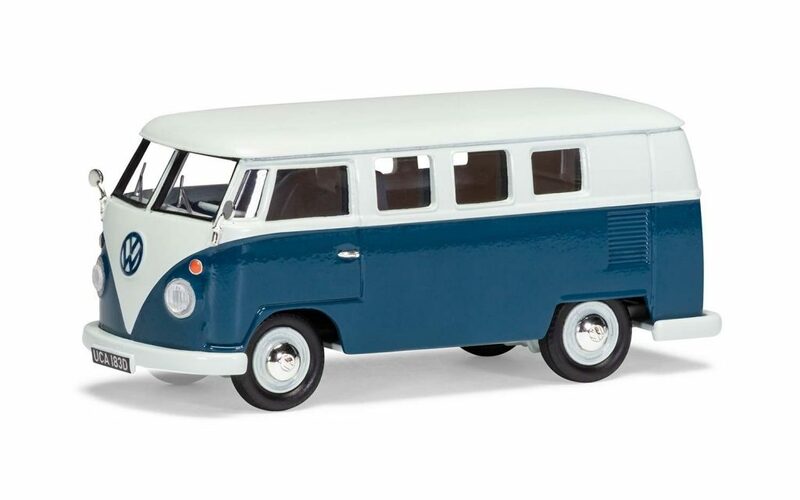 Production commenced in 1950 and other variants such as pick-ups, campers and buses were soon available. The ‘split-window’ was produced until 1967, by which time 1,477,330 had been made. 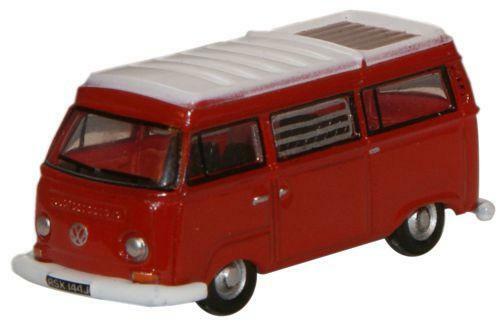 Een verbeterde versie van de Volkswagen T2 Camper van Oxford diecast in schaal 1 op 148. Een wel heel kleintje dus! Uitgevoerd met een verhoogd dak en de bruine latten voor het verstouwen van meer bagage bovenop. De kenteken registratie is RSX144J , gelijk aan de echte die model stond voor dit kleintje. 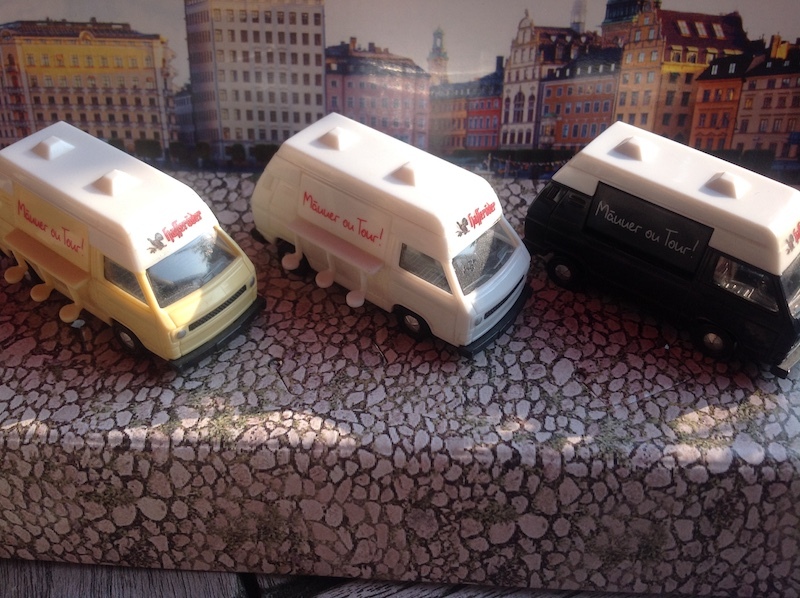 Alle details zijn aanwezig, de witte bumpers, zwarte raamlijsten en ‘chrome’ details. 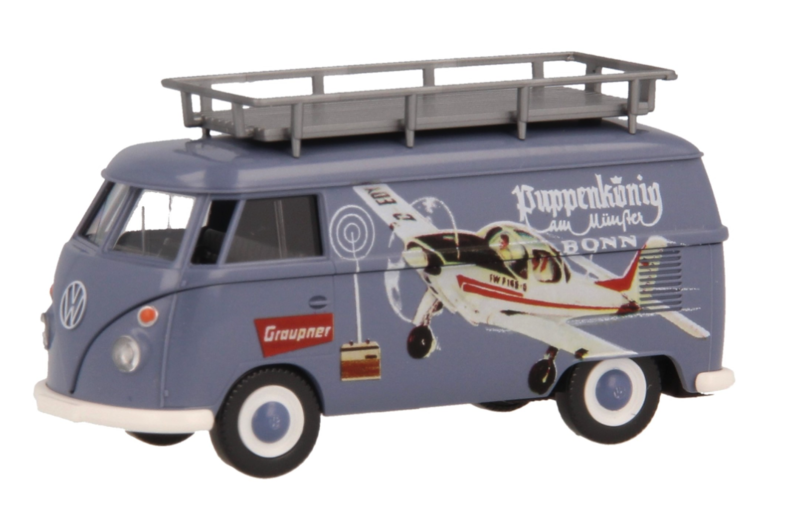 An innovative modification to the N scale VW Camper introduces an elevated roof with clear panel, indicating it as having reached its final camping destination and in full use with the added headroom. The rear of the roof also has the slatted brown base for extra luggage and equipment storage. Registered RSX 144J, our little Westfalia has all the authentic markings of the real thing in minute detail, including its white bumpers and wheel trim. Additional masking in silver and black, including the louvred effect side windows bring it to life even more. 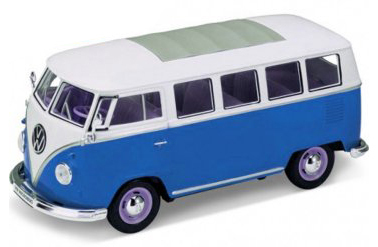 From Maisto in scale 1:24, the classic VW T1 from 1962 in two tone, white/blue. 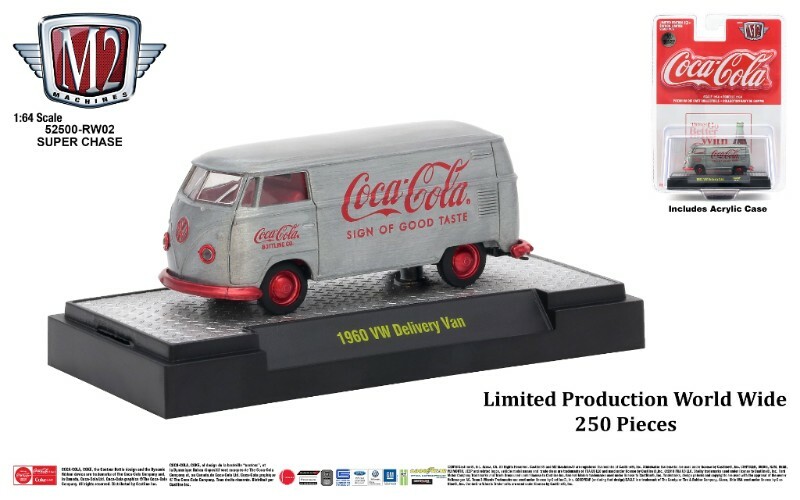 SUPER CHASE, limited edition 250 pcs.